HomeSeer works with many different protocols. All of these protocols require a plugin to be installed. 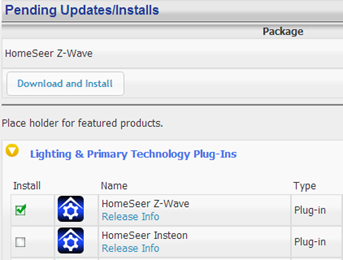 There are HomeSeer Tech plug-ins and many 3rd party plugins. Please follow the instructions below on installing a plugin. Note: Some plugins will be in the BETA section at the very bottom. Open the PLUGINS drop menu and click Manage. Expand the Additional Interfaces section. This will present you with a list of categories. Each category has a list of plugins that can be installed. Expand the category your plugin is located in. After you have selected the plugin or plugins you wish to install, a Download and Install button will appear. Click this button. You'll be given a progress bar under the Installed Plugins section indicating the status of the install. You must now Enable your plugins to use them. Once they are enabled they will be available to configure. Some plugins will require you to enter a COM port before going into the configuration pages. To get to the configuration pages, open the PLUGINS drop menu again. Your installed plugins will now be listed in this menu. Hover over them to access the configuration pages.